Providing and installing 10 nos. of Rope pumps in five villages for the use of School children in 3 Primary Schools and by 175 households in the Sethubavachatram block of Tanjore District, Tamilnadu. In the Sethubavachatram Block, Tanjore District there are 37 Panchayat villages. In total, there are 77 nos. of Government Primary Schools and 22 nos. of Government Middle Schools functioning in this Block. Most of the Schools have drinking water source through the Panchayat and in some Schools the staff arrange for the drinking water from nearby households, public tap. At the first instance 3 Primary Schools which do not have water source have been identified and Rope pumps will be installed in these Schools. Ekoventure NGO is coordinating 25 women SHGs with a total strength of 362 members in this block. In the five villages (2 are coastal villages) identified for this project, the women SHG members face acute shortage of drinking water. Hence 7 rope pumps will be installed as per requirement of the women SHGs in their location and site identified by them. 144 School Children in 3 Primary Schools will get safe drinking water from the 3 Rope pumps and approximately 16 staff will get water. 175 women (families) will get water from 7 Rope pumps to be installed in 5 villages. The average family size is 4.5 and thus 800 people will get water from the community rope pumps. 2 Workshop men will be trained in the production and installation of the Rope pumps. The staff of the School, village youth and the women SHG members will be trained on the day-to-day maintenance and in carrying out small repairs of the Rope pumps. The field staff of Ekoventure jointly with the SHG leaders will monitor the operation and maintenance of the Rope pump and report in the weekly meetings. Rope pump is a house hold level pump for drinking water and small scale productive use like kitchen gardening in areas with ground water availability at shallow depths not exceeding 35 m. It can be used as a better substitute for the conventional hand pumps. Hand pumps are mostly used for lifting water from the subsoil water table which is unstable, fluctuating and even depleted during dry period thus making the pump defunct. But, the suction head of the rope pump can penetrate beyond the subsoil water table and reach the shallow water bearing aquifers which are comparatively stable, continuous with higher capillary pressure to render the pumping easier. Therefore, rope pump is more effective and ideal for tapping ground water from the aquifers like alluvial aquifer, Cuddalore sandstone aquifers and ottai aquifers which are found to be reachable even from 10 m up to 35 m. The demonstrations conducted by Ekoventure by installing rope pumps in identical areas of Anumanthai in Villupuram district, Tamilnadu reveals the technical feasibility and community acceptability for rope pumps. Rope pump design is based on the ancient chain and washer system and consists of endless rope with pistons that fit into a PVC pump tube. At the bottom, the rope with pistons is guided into the pump tube. With a wheel the rope is lifted and the water is elevated to the surface. 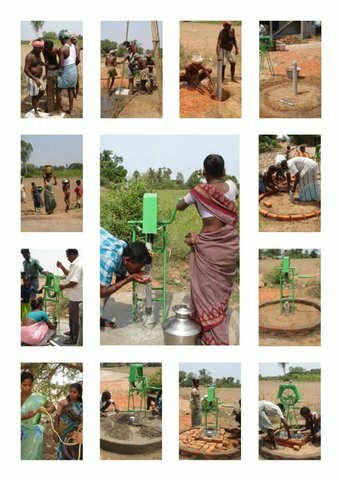 The rope pump can be produced with locally available standard materials and with local skills and artisans. It is, therefore, simpler to repair, has light and non-corrosive parts and is cheaper to produce. At the instance of Ekoventure, 3 local workshops Villupuram District, Tamilnadu and at Pondicherry were already involved, trained and made conversant with the production and repairing skills so that facilities are readily available to train, produce and install the required number of rope pump units. The yield of water at shallow depth is about 30 liters per minute. At the rate of 20 liters per head, for a family of five members about 100 liters of water is required for drinking and cooking purposes. Therefore, one rope pump can cater to the water requirement of about 25 families by operating the pump for duration of about two hours with frequent intervals, assuming the water for external use is met from other sources. The Rope pumps to be installed in the Schools will be owned by the School and will be maintained by the women SHGs. The rope pumps installed for the households of women SHGs will be owned by the group and maintained by them. This project is taken up in the first phase in the villages where women SHGs motivated by Ekoventure do exist. The women SHGs in the respective villages have agreed to bear the costs related to the operation and maintenance of the rope pumps. 2 locally available workshops will be Trained on production and installation of rope pumps. The women SHGs have agreed to maintain the system and contribute towards the cost of operation and maintenance. The other application will be reviewed and this one will inherit all the q&a and reviews of the other. I know very little about rope pumps and the water situation at this site. Has any consideration been given to using electric pumps, given the high subsidy for electricity available from the government? Is there any pre-construction water testing to ensure that quality water meets basic standards? If necessary, who will pay for water treatment? Can you please correct the numbers? - 175 women (families) translates to how many people getting water from community pumps - 144 children at school should be in the reflected in the school children numbers. Can you please correct the numbers? - 144 children at school should be in the reflected in the school children numbers. and in an average of 16 staff in these 3 Schools will also get water. Please edit your application and put these numbers and the explanations in the appropriate fields. Thanks. Please edit your application and put these numbers and the explanations in the appropriate fields.